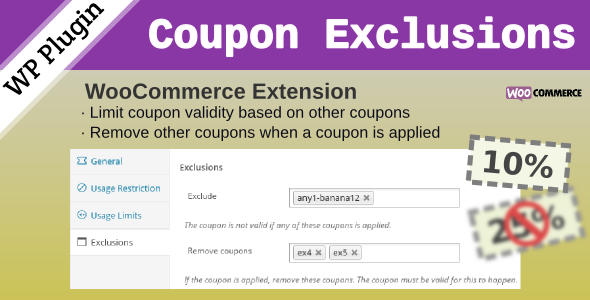 This WordPress plugin allows to restrict the validity of a coupon based on other coupons applied. It also allows to remove specific coupons when a coupon is applied. This extension is available on CodeCanyon. If an item is on sale and then a coupon code is used will it override the sale price and apply the coupon instead? Coupon exclusions don’t override sales prices, this is used to exclude some coupons being used when others are applied. I’m looking for some minor changes for this plugin. 1) Notification message for invalid coupon. 2) Notification message for remove coupon. Those message is to avoid the conflict with the customer as they might not (actually is never) read the T&C of the coupon. I hope you will consider my suggestion and include it in next few update. Thank you very much for the suggestions, I will check if we can add these improvements and consider them for an upcoming release. Would love to see capability added where we can Exclude a group of users or a group of coupons. Use case is we need to identify customers who have already purchased to exclude them from using the coupon. Second use case, more important one, is to exclude a group of coupons as opposed to individual coupons from use. We have to allow coupon stacking for our affiliate coupons which means that customers can stack affiliate coupons giving them greater discounts. We can group all the affiliate coupons together but need a way to exclude the affiliate coupons from each other. There’s no way to copy the entire affiliate list to the exclude field either which is a problem. Your proposals sound very interesting. I send them to check them for future updates. 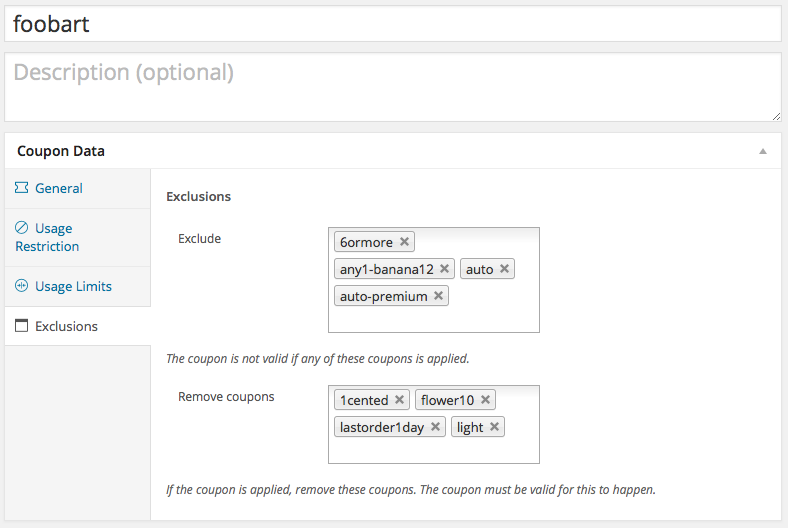 I have had the Coupon Exclusions installed and working since January and have a fairly complex arrangement of coupons based on products purchased and they are setup in a hierarchy where once the customer selects a product in the higher discount coupon eligibility criteria, the previously auto-applied coupons would be automatically removed using this exclusion plugin. Today it stopped working and now am getting an “invalid coupon” for the coupons that the exclusion rules are supposed to – and USED TO – remove. The invalid coupons don’t show up in the bottom section of the cart – the valid ones do as appropriate – but the invalid ones are somehow still attached and the invalid status makes it impossible for customers to checkout. I just renewed my support, so I am hoping to get a response asap. …nevermind. I figured it out. I have not confirmed that it was actually working under the conditions that caused the error. I just assumed it was because it had been tested. Well I spoke too soon. As it turns out, the coupon that is supposed to be removed (via the exclusion) is still in play, but flagged invalid. I only have a work-around now of setting it to “individual use only” but that won’t work in a few weeks when I need it to work with other manual coupons. I don’t understand how this suddenly stopped working properly when there have been NO changes or updates to anything. Please can you give me an example of use? So I can test it. // hide COUPON field on cart page – Comment Out when coupons are in season! When I commented the code out to enable the coupon code entry for one of the two times he offers customer entered coupon discounts to be used in conjunction with the automatic discounts. But with that code commented out, the “Invalid Coupon” comes up when auto coupon conditions overlap. Before I realized it was that code causing it, I was able to stop it by enabling the “Individual Use Only” option on those specific coupons causing the error. So – – the coupons that error when they overlap with the conditions of what should be overriding coupons have their exclusions set. I purchased and installed the coupon extension “Coupon Messaging” to be able to determine which coupons were triggering the error (it used to just say “coupon is invalid”). Bottom line is that I need to be able to turn OFF the individual use box and allow these coupons to be used with a customer entered coupon code, as well as to have the coupons be “removed” automatically when the higher priority coupons apply. As I mentioned, it’s a very complex set of discounts and took me a long time to make it work to the extent that it does. I can give you access to the development server if you email me directly. If you want to hide the coupon fields, you could use CSS or overriding the woocommerce pages in your child theme. I think that the filters that you have used have side effects. Hiding the coupon fields is not the problem – I can do that, but the problem is that I can’t use a customer entered code IN CONJUNCTION WITH an auto-coupon if I have that auto coupon set to individual use only because it errors (invalid due to exclusions) when it’s qualifying products are in the cart with the overriding coupon’s qualifying products. Bottom line is that the INVALID COUPON error should not show when a coupon is auto-applied and then overridden by the exclusion setting of another coupon. Are you using any plugin to auto-apply coupons?